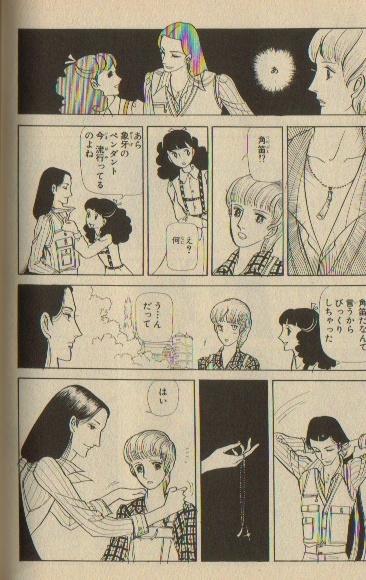 Jack comes to Hokkaidou from Tokyo to stay at his relatives place because he has a lung disease. He is very unhappy that he should stay there without going to school when his rivals study hard to pass the entrance exam of universities. In the first night in Hokkaidou, Jack hears birds whispering "He's arrived", "He's arrived." Jack meets Fuuno Lin. Jack feels familiar with him even though he meets him for the first time.�@Lin gives Jack a bugle pendant. Lin says Jack needs it. One day, Lin visited him with a black horse. Jack calls the horse Kelpie. Jack doesn't know why he knows the name. When leaving, Lin tells Jack to open the Moonlight Shadow Window if something happens to him. One evening, Kelpie takes Jack's pendant and flees into the wall of Jack's bedroom. Jack notices the moonlight projects a reflection of a window onto the wall. He pushes it. The Moonlight Shadow Window opens and Jack stands in a sunny field where lilacs and mugues are blooming. Jack meets Pook the deer in the field. Pook is looking for something warm that makes us happy. Jack isn't sure what Pook is looking for. Pook shakes Jack's hand and says it is something like that. Jack thinks he can give it to Pook. Jack and Pook walk together toward Lake Mashuu. When Pook is attacked by Herpie and is terribly injured, Jack gets very angry and he attacks back Herpie. Herpie disappears in the thin air by Jack's magical power. Fuuno Lin is called Cuchulainn in Nymphidia. He advises Jack he should go into a well to see Ihika to get a medicine to cure Pook's injury. Pook gets better. Cuchulainn shows Jack the way to the elm tree to go, and says they will meet at midsummer night again. Touching the elm tree, Jack goes back to the real world. Next evening, Pook comes to Jack's places and invites him to go to the Midsummer nights meeting in Nymphidia. Pook opens the Moonlight Shadow Window to go into Nymphidia and Jack follows him. Jack sees a lot of elfins, Cuchulainn and Ihika there. Cuchulainn says everyone is looking forward to seeing a new Fairy King (Youseiou). Jack thinks Cuchulainn must be the new Fairy King. Suddenly there's a lightening and Queen Maeve appears in the sky. She states she is the new King of Nymphidia, who rules both dark and light elves. Cuchulainn tells elfins to calm down and tells Jack to play the bugle. The bugle gets bigger. When Jack plays the bugle, Queen Maeve disappears from the sky. Jack : Wow, this bugle's great. It has a magical power. Cuchulainn : No, Jack. The bugle has no power unless you play. The one that controls the bugle will be the new Fairy King in Nymphidia. Pook is surprised to hear that. "You are the new Fairy King, Jack." says Cuchulainn. Cuchulainn tells Jack about Nymphidia. Nymphidia was ruled by King Nudd and his son Gwynn. One day, Gwynn fell in love with a five-year-old girl who had blond hair and blue eyes. She was Elizabeth, who is Jack's great grandmother. She had the same spirit as elves when she was very young. She was given the bugle pendant by Gwynn. She had lost the memories and the spirit of Nymphidia when she came to Japan to marry a Japanese man. However, elfins have been waiting for the one who plays the bugle for years. Jack : Gwynn will be the next Fairy King. Cuchulainn : Gwynn's not dead, Ihika. Ihika: People say "he's dead" in the human world, you know. He lost against the dark elves because he had commit two things that he mustn't have done. He loved a human, and he was betrayed by his friend. Cuchulainn: That's not true. I didn't betray him. Ihika: It's practically the same as a result. Cuchulainn: Possibly. He's not dead, though, because the one who is standing in front of us is Gwynn himself. Jack : Do you mean me? Cuchulainn: Gwynn said that the one who can play the bugle would reappear someday and it would be him. Ihika: I'm not so sure. Jack is just a great grandson of Elizabeth, who was given the bugle by Gwynn. Cuchulainn: I'm sure he is. Ihika: Time can tell. If he is really Gwynn, he'll be able to get back the ring that is made of the word that Gwynn lost from Queen Maeve. Jack: The ring that is made of the lost word? Cuchulainn: You need to get it back. Queen Maeve locked the word in the water and she wears the water ring around her finger. We are not able to see or touch it. Ihika: Only the true Fairy King is able to remove it from Queen Maeve. Jack: It's too difficult for me to do. Cuchulainn: You must do that. You are aware there have been many earthquakes recently. It shows that Queen Maeve and dark elves are trying to rule the human world. Only you can save the humans and light elves. Jack: I can't be the Fairy King. Cuchulainn: How did you feel when you met me for the first time. Cuchulainn: You knew me. Gwynn mustn't have forgotten me. I mustn't have mistaken someone else as Gwynn. Ihika hurries to the dark in the well so nobody can see his face, which shows jealousy to the close relationship between Jack and Cuchulainn. Jack returns home before he leaves for Lake Mashuu to fight with dark elves. Cuchulainn takes him to the elm tree and tells him to start. He mentions the road goes to Lake Mashuu as long as Jack goes on with belief. Cuchulainn adds that he is always with Jack and that he will appear whenever Jack needs him. On his way to Lake Mashuu, Jack meets Sarah. Sarah is a salamander that Queen Maeve sent to kill Jack. She tries to seduce Jack but fails. They start to walk to Lake Mashuu together. Pook follows him and helps Jack fight with Herpies. Lucifer appears and states he'll be the new Fairy King. He joins the group. They meet centaurs. A centaur tells Jack Queen Maeve was Gwynn's fiancee. Jack wonders why she's become the queen of dark elves even though she was his fiancee. Lucifer says she was in love with Cuchulainn. They see an angel weeping on the road. He is Hippogriff. He says he's not an angel even though he has wings. He was weeping because he suddenly lost his sight and got lost. Jack takes his hand and walks together with him. When Hippogriff regains his sight, he changes his shape into a Pegasus and takes Jack to Helicon, where Pegasuses live. Lucifer changes his form into a demon to chase them. Jack walks down the stairs from Helicon to the ground to escape. When he reaches the ground, it's winter there. The god of winter stabs him. When Jacks blood touches the bugle, it emits light and sound. 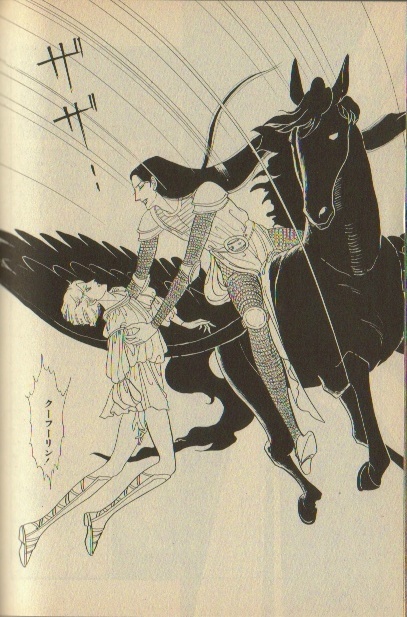 Cuchulainn comes with a black Pegasus, Arion, to help Jack. Jack is taken to the nearby spa. In Jack's dream, Gwynn is crying because his friend has gone with a woman. Elizabeth says to him his friend will be back for sure and he should trust him. A week later, Jack gets better. Cuchulainn encourages Jack to go to Lake Mashuu as soon as possible because Queen Maeve is thinking of making all the volcanos explode before Jack arrives at Lake Mashuu. Cuchulainn lends Jack his horse, Kelpie, and tells Jack to trust Cuchulainn whatever happens. Even when Jack and Kelpie arrive at Lake Mashuu, Kelpie wouldn't return to Cuchulainn. Kelpie tells Jack that everyone but Jack in Nymphidia knows Cuchulainn is Queen Maeve's lover. Jack asks Pook if it's true. Pook says he can't tell it's true or not, but it seems to him everyone believes it. Pook says Kelpie is in love with Queen Maeve and that's why he stole the bugle from Jack. Pook says Queen Maeve is the "desire", which is so powerful that Kelpie can't resist her. Jack doesn't think he would forgive Cuchulainn if he is her lover. Then an earthquake suddenly occurs and Jack hears a woman laugh. Jack wonders why the bugle has become so heavy. Jack remembers the words of Elizabeth and Cuchulainn. Queen Maeve looks at the well of vision. She sees Jack and Lucifer coming to her place. Jack and Pook start to swim toward an island in the lake. On his way to island, a big octopus takes Jack into the water. Jack hears Gwynn say to him "Stand up, Jack." Jack sees a castle in the water. Lucifer gets into Queen Maeve's place. Queen Maeve says she would give the ring of water to Lucifer if he takes the bugle away from Jack. Lucifer mentions he can't have a trust on Queen Maeve. Queen Maeve tells him to trust her. Lucifer laughs at her. Queen Maeve invites him to sleep with her. Lucifer decides to help her kill Jack and changes his shape into a demon. He calls the headless knight to fight with Jack and goes into the bedroom with Queen Maeve. Seeing Jack fighting with the headless knight, Sarah advises Jack that he should take the head away from him. When Sarah feels happy to see Jack win the fight, Lucifer comes back into the room He looks very tired. He has horns and goat legs. He's lost magical power that enabled him to change himself into a human shape because he slept with Queen Maeve. Queen Maeve orders Sarah to change her shape back into a salamander and fight with Jack. Even though Sarah doesn't want Jack to see her in a salamander shape, she's not able to resist Queen Maeve. When Jack is fighting with a big salamander, a big deer appears to help him. The deer is Pook Jack kills the salamander. Jack fights with some other creatures that Queen Maeve sent for fighting with him. Looking at Jack, who looks exhausted, Queen Maeve metamorfoses into a dragon to fight with Jack. 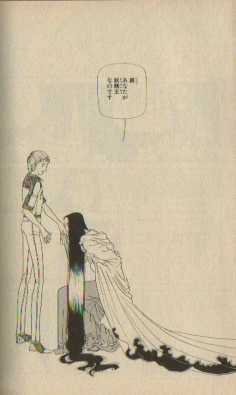 Jack cries out "Help me, Cuchulainn." Cuchulainn arrives immediately. Jack cuts off Queen Maeve's right arm. She goes back into the castle. Ihika encourages Queen Maeve to stop the fight. He is a son of a dark elf and Queen Maeve's father. He says dark elves can't be loved by whom they want to really be loved and that Queen Maeve shouldn't try to get a power instead of love. Queen Maeve says she has a trump that can beat Jack. Jack, Cuchulainn, Pook and Pegasuses go into Queen Maeve's castle. They see Ihika sitting in the room that has a well of vision. Ihika wouldn't allow them to go any further. When Ihika and Cuchulainn are fighting, Jack and others go on into inner area. Jack goes into a beautiful hall that has another well of vision. "You've arrived here finally." says Queen Maeve. She looks very pretty and has both arms. Queen Maeve: Poor Jack. What makes you look for the ring? Queen Maeve: That's what Cuchulainn said to you. You're a dummy of his. Queen Maeve: Look into the well of vision, and you'll see I'm right. "Don't, Jack. It's a trap. Trust Cuchulainn." whipers someone in Jack's brain. Jack can't help looking into the well. Jack sees Queen Maeve and Cuchulainn making love. Queen Maeve: Your first follower slept with me. Cuchulainn slept with me, who was Gwynn's fiancee. He betrayed Gwynn. Jack: Stop saying that. It's you that betrayed Gwynn! Queen Maeve: It was Gwynn that betrayed me! He loved a human girl and Cuchulainn more than me. I loved�c�c�c No, I didn't love Gwynn, but he injured my pride. I seduced Cuchulainn. Gwynn looked at the well of vision and died out. The one who is betrayed by his friend can't become a Fairy King. Jack: It was because he didn't trust Cuchulainn. I do trust Cuchulainn. Queen Maeve: Look at the well of vision again! Jack wouldn't look into the well again. Cuchulainn asks Ihika to let him go. "Do you know why Nymphidia is in a bad way?" asks Ihika. He says to Cuchulainn " Whether you slept with Queen Maeve or not is not very important. The actual reason is that Gwynn and you loved each other too much. Your ties were too strong for my sister or me to join. " Cuchulainn hits Ihika's sword and Ihika drops it. "You can kill me." says Ihika. Leaving the room, Cuchulainn says "I loved Gwynn, but I really wanted him to marry Queen Maeve. Gwynn was young and he preferred hunting and games to being with Queen Maeve those days. He needed time. Queen Maeve should have been patient." Cuchulainn adds, "I know you love me. You shouldn't have cared about your father being a dark elf and you should've been more friendly." Lucifer says to Jack, "Cuchulainn didn't sleep with Queen Maeve. I've lost all my power, but he hasn't lost anything." Cuchulainn goes into the room and says it's not him that is making love with Queen Maeve in the image of the well of vision. Ihika changes the image in the well and everyone sees that it's Ihika who is making love with Queen Maeve in the image. 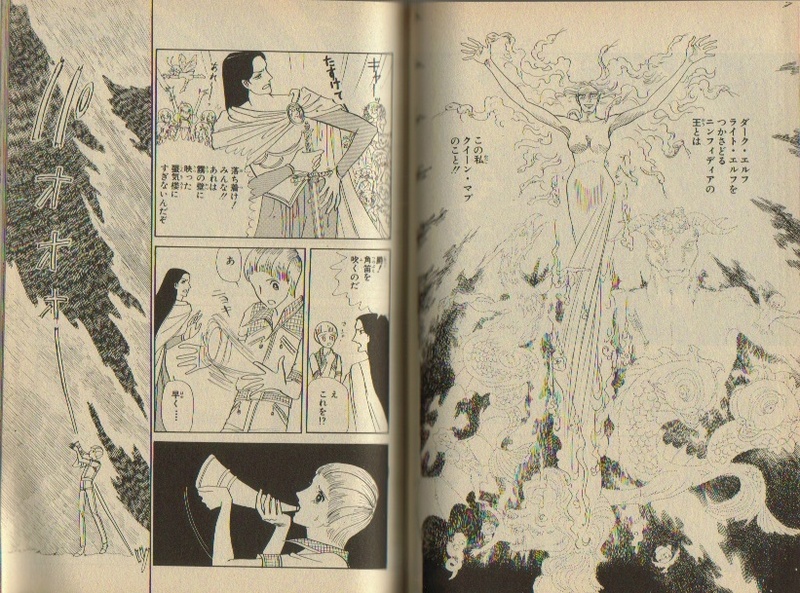 Ihika appears in the well of vision and encourages Jack to look for the ring of water. Queen Maeve tries to make the statues in the hall attack Jack. Cuchulainn tells Jack to calm down and concentrate. Jack hears Gwynn say " You cannot see the light in the light, you cannot see the dark in the dark." Being sure the ring of water is in the water, Jack dives into the well of vision. He finds the ring and shows it to Cuchulainn. "Gwynn's trust has come back!" cries Cuchulainn. Cuchulainn tells Jack to wear the ring and play the bugle. When Jack plays the bugle, knights of the Red Branch start marching to the castle. Cuchulainn used to be the leader of the Red Branch. But the knights disappeared when he lost Gwynn's trust. They have to get out of the castle before the Red Branch play the bugle seven times. Even though Cuchulainn tells Ihika to get out with them, Ihika gets into the room where Queen Maeve is. Immediately after the Red Branch play the bugle seven times, the castle explodes. Jack is laying near the elm tree when he wakes up in the real world. When he is walking home, he sees his cousin Miyako. She bursts into tears when she sees him. Jack has been missing for two months. Fuuno Lin and Jack left for Lake Mashuu and they disappeared. Their car was found in Lake Mashuu and people had thought they died. It's surprising that Jack has become perfectly healthy. Fuuno Lin is missing even now, but Jack is sure he'll be back. 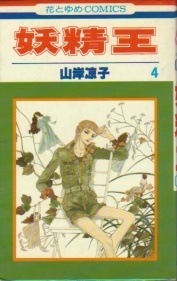 Jack decides he'll stay in Hokkaidou waiting for Cuchulainn and other elves in Nymphidia. 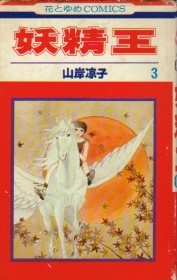 Three vols of bunko edition published by Hakusensha is in print.